One of the struggles going through this list is to pace playing certain franchises so we don’t play them too soon, and the Mario series is a clear example of that – we playing the important Super Mario Bros. quite early on, started the first of the RPG series, Super Mario RPG, soon and started the 3D iteration Super Mario 64 within the first few months. With only a few games int he last series, Super Mario Sunshine, the previous game, took half a decade to get around to, but I feel I get to play the first Wii installation further. As the Wii was popular, it feels like the main Mario game for the platform was a swell, and I’ve played around with it a bit before – before we started the blog and when I still really needed to learn the Wii controls. I hope this attempt will go better. I feel like the 3D Mario series still suffers from its camera controls. 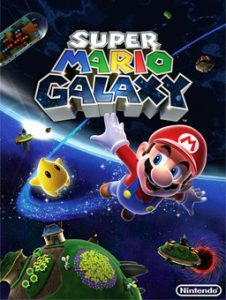 While the original game introduced an impressive leap forward, I’ve always struggled when the games took that control away from me and comparing Super Mario Galaxy to its contemporaries show that it tends to struggle. The game’s first galaxy – the areas the game is divided in, ignoring, the scientific background of all of this – has no free camera controls, and when you’re running around small, weirdly oriented planets, it screws with my orientation more than it normally would. The game’s basic idea works well, though. Rather than working on a flat world, you have several planets, some very small, others a lot larger. A number of them are spherical, as you’d expect, albeit it sometimes with pretty large holes (or black holes inside, if you need more of a challenge). Others are more oddly shaped – hourglass and dumbbell shapes show up and weirder shapes as the level dictates, with some of them creating chunks that look more like a standard level. In most galaxies, you travel between a bunch of them, neatly separating the areas although I’ve not encountered the branching paths I expected, other than when used to create different paths for different stars. Sadly, it feels like these galaxies don’t have many stars each, so you don’t spend a lot of time in each. They’re large areas, but sometimes they feel quite underused, which is a shame. This is especially the case in galaxies with a strong theme, such as one focused around bees, that feels like it could house a lot more. Super Mario Odyssey has spoiled us at this point, but compared to the others it still seemed sparse. As always, the presentation of a main Mario game is perfect. It looks good, is creative, is great at teaching you the mechanics and redefines what a Mario game is once again. It’s let down by the camera controls, but beyond that offers a great game that might be outshined now by Super Mario Odyssee, but stays addictive in its own sense.